“Steel is cheaper than potatoes” — a recent quote from a leading OEM materials expert. All of which goes some way to explaining the continued dominance of steel in automotive construction. So let’s wait and see: Perhaps steel will soon become even cheaper than flour! More than ever, when Chinese industry will be selling its steel in Europe at “everything must go” prices due to new US tariffs. European steel companies have long sung the praises of cheap Chinese steels, as evidenced by the merger of Thyssenkrupp and Tata Steel. But despite steel’s continued dominance, multi-material construction is also progressing, more typically in the form of mass vehicle production than multi-metal lightweight construction. With numerous engineers striving to devise reliable and cost-effective joining processes for steel and aluminum, the aluminum content in automotive construction is on the rise. And prices are following suit. Which underlines the appeal of yet another material: Magnesium. While aluminum grows ever-costlier, the price of magnesium is stagnating. Prices could even stabilize in the foreseeable future, as a presentation given by a DERA expert recently brought home to me. 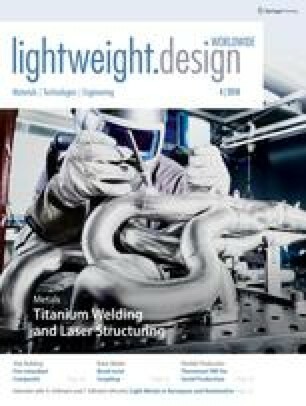 News which lightweight metal builders in particular would welcome: Magnesium is only about a third as heavy as aluminum, but retains high specific strength. Scientists have already been tackling the issue of producing and forming magnesium sheets for some years now. Developments that could help the material, primarily used in die casting to date, achieve a breakthrough. Moreover, magnesium remains in almost boundless worldwide supply. But despite the availability of this raw material, there is one problem to stay. Trade is currently dominated by a single country: China. The country has more or less taken over the market within the last two decades, with 80 % of magnesium traded originating from China. Two ideas now come to mind. Firstly: Build up in-house magnesium production capacities, although the example of steel suggests this would be far from promising. Secondly: Refrain from using the material in the first place. For a country dependent on raw material imports anyway, both options would signal a retreat into the national sphere in some sense, which — as in all areas of the economy and society — is also the wrong answer. To reduce dependency when procuring this outstanding material, we should instead leverage our given capabilities as lightweight builders and recycling world champions — i.e. using the material efficiently, or in terms of lightweight builders: using it in a load path-compliant manner and consistently recycling magnesium once used.